Thousands of people marched to the Japanese consulate in Shanghai and hurled rocks and bottles in a second weekend of anti-Japan rallies as China said relations with its neighbour were at a “crossroads”. Onlookers estimated between 5,000 and 10,000 people marched along the main Yanan Road in a massive protest that stretched for about one kilometre (around half a mile), causing traffic chaos in the large commercial city. A group of protesters hurled objects including rocks and bottles towards the building, although it was not immediately clear if they caused any damage, an AFP reporter witnessed. The Independent is reporting that Beijing has cracked down on anti-Japanese protesters in an apparent attempt to defuse a movement it fears could spiral out of control. Many suspect last weekend’s protests were condoned by Beijing; TV pictures showed Chinese policemen looking on as the protesters rioted, and Japanese students who were beaten in Shanghai have said police officers ignored or cursed them as they were being chased through the streets. 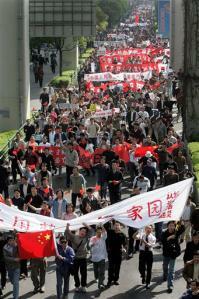 China has warned its citizens against participating in anti-Japanese protests fearing they may spiral out of control. 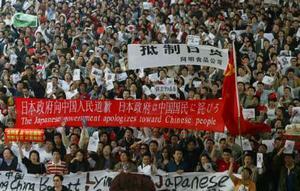 Chinese activists have threatened large-scale protests in major cities this weekend to protest against Japanese textbooks that China believes whitewashes Japan’s bloody wartime record and opposing Japan’s bid for a permanent UN Security Council seat. Japan and the United States have issued urgent alerts for their citizens to be careful. A mailbox, doorplate and intercom at the official residence of the Chinese ambassador to Japan in Tokyo’s Minato Ward have been vandalized, police said Friday night. The graffiti with red paint appears to be in response to growing tensions between the two countries, the police said, adding they are investigating the case. The two countries have not seen this much tension since they normalized relations in 1972. Update: Robert Mayer at Publius Pundit has a brilliant post on the China situation.